England beat Jamaica 66-44 to take bronze as hosts Australia retained the Netball World Cup in Sydney. Tracey Neville's England, who finished third at the last tournament in Singapore in 2011, found themselves five goals adrift at the end of the first quarter on Sunday. But the Roses produced a stunning turnaround to end the first half 28-23 ahead and saw the game out with ease. Australia overcame rivals New Zealand 58-55 to win their 11th title. The Silver Ferns had come into the final unbeaten after a shock win over Australia in the group stages, but a nine-goal deficit from the first quarter left New Zealand unable to catch the Commonwealth champions. 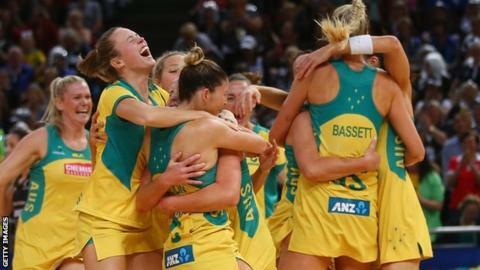 The final was played in front of a world-record netball crowd of 16,752 at the Olympic Park. England's defeat by Jamaica in the bronze medal match at the Commonwealth Games in Glasgow last year prompted changes behind the scenes. Neville was brought in as interim coach for the World Cup, replacing Anna Mayes, but she endured a tough start to the tournament after the death of her father before their opening win against Scotland. Her team battled to a 54-50 win over Jamaica during the first pool stage in Sydney, but went on to lose to Australia in the second round and New Zealand in the semi-final. England made a laborious start in the third-place play-off, but the introduction of experienced defender Sonia Mkoloma, playing in her fifth World Cup, helped settle the Roses. And wing defence Serena Guthrie played a starring role in their second-quarter revival as they produced a 10-goal swing to go five points ahead. England got stronger in the second-half with shooter Jo Harten dominating under the posts as they brushed their rivals aside to take the bronze in style. Coach Neville told BBC Sport: "It was hard to get them motivated, but we got behind each other. They've always had my back, and I've always had their's. I think we showed that today. Wales ended the competition in seventh after winning their play-off 64-41 against Uganda to claim their best finish at a World Cup since 1991 - when it was also hosted in Sydney. Scotland ended the tournament 12th after losing their 11th-place play-off 51-41 against Fiji. South Africa narrowly beat Malawi 48-46 to secure fifth spot, while Trinidad and Tobago ended ninth after beating Samoa 64-51. Meanwhile Barbados ended 13th with a 53-38 win over Zambia and Sri Lanka finished last after losing 59-32 to Singapore.